John Young saluting the flag while jumping! Apollo 16 Lunar Module (LM) Orion and the Lunar Roving Vehicle (LRV) are in the background. Credit: NASA/Charlie Duke. 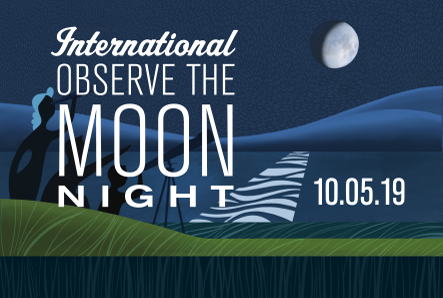 LRO was designed to produce the most detailed maps yet of the lunar surface. 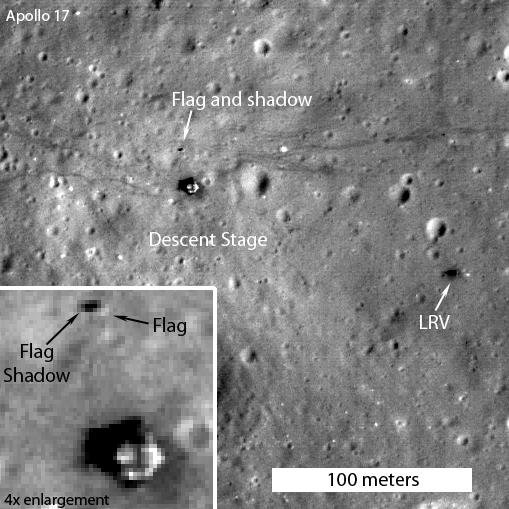 Not only did the spacecraft image the Apollo sites, but it captured details like the Lunar Module descent stages, rover tracks, and now the American flags. Images taken by the Lunar Reconnaissance Orbiter (LRO) have shown that the American flags left on the Moon by Apollo astronauts are still standing– except for the Apollo 11 mission, which Buzz Aldrin reported as being knocked over by engine exhaust as Apollo 11 lifted off. 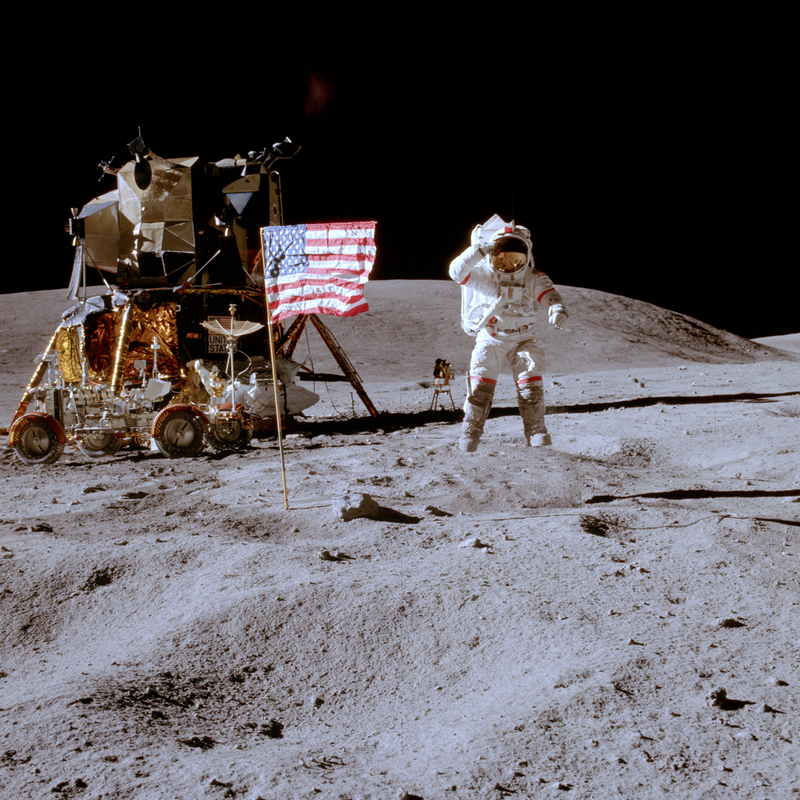 Each of the Apollo missions to the Moon planted an American flag in the soil. By studying photos of the Apollo landing sites taken at different times during the day, scientists observe shadows circling the points where the flags are thought to be. LRO slewed 19° down-Sun allowing the illuminated side of the still standing American flag to be captured at the Apollo 17 landing site. 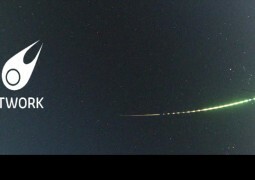 Credit: NASA/GSFC/Arizona State University. “From the LROC images it is now certain that the American flags are still standing and casting shadows at all of the sites, except Apollo 11,” writes Mark Robinson, chief scientist for the LROC camera. “Personally I was a bit surprised that the flags survived the harsh ultraviolet light and temperatures of the lunar surface, but they did. What they look like is another question.” The flags may in fact be badly faded. This time lapse movie shows a sequence of images highlighting the movement of the flag’s shadow at the Apollo 12 landing site. Visit the full resolution NAC of the Apollo 16 site and see a full resolution version of the Apollo 12 time series on the LROC Website.